These educational gifts are always appreciated for their early learning value and the entertainment they provide. 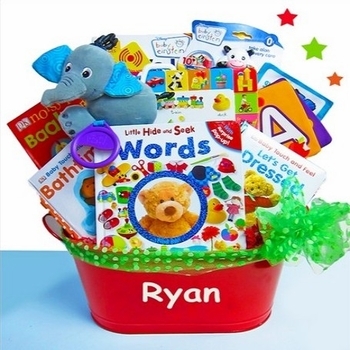 Our designers have created some adorable basket and mini wagon sets that are loaded with activity books, Baby Einstein products, CDs, DVDs and other newborn essentials! Each creation makes a perfect shower gift or to welcome the new arrival and congratulate the parents at home. You will also find some great ideas for toddlers to make these ideal for birthdays too!